Get one of these four unique 14-shot, 500-gram repeaters. 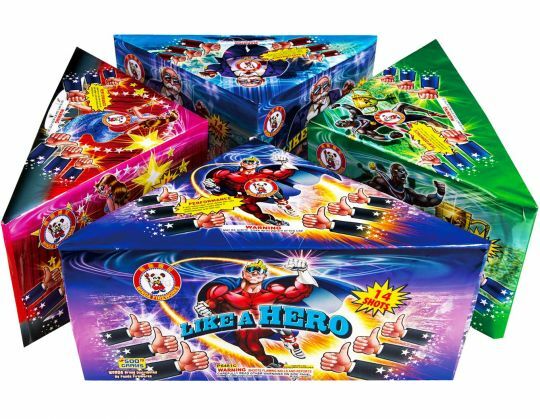 Each firework features colorful mines with unique effects. Like a Boss: brocade mine with white/green/red strobes to brocade crown with white/green/red strobes. Like a Champ: time rain mine with green dahlias to green palm/crackling willow/dahlia with time rain. Like a Hero: silver strobe with color pearls mine rises to gold willow to red/blue/green and color tips. Like a Star: purple with white strobes mine to purple dahlia or palm trees, finale of crackling purple mine to purple palm with silver chrysanthemum. Knock Out: A series of red, silver, and green comets, colored tails to palms, blur stars with fish, then red and green comet tails to time rain.